VĨNH LONG — The Mekong Delta province of Vĩnh Long will review and streamline procedures as part of its administrative reform and efforts to improve the quality of public services. 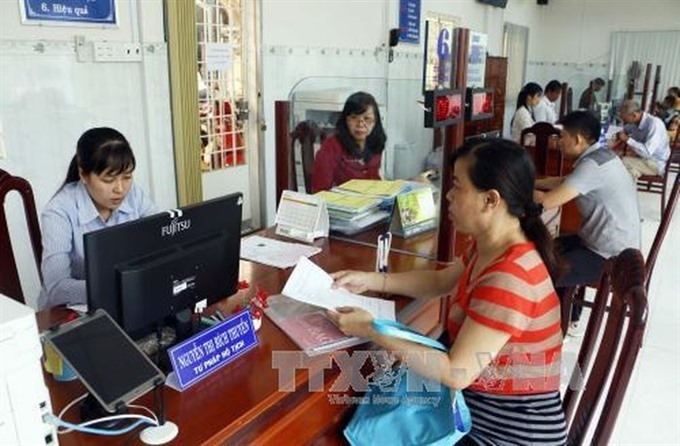 Vice chairman of its People’s Committee, Lê Quang Trung, said on Thursday that the province would speed up work on a proposed public administrative centre and adopt a competitiveness valuation index to rate government agencies and district people’s committees. Nguyễn Phi Hùng, deputy head of the province’s Department of Home Affairs, said administrative reforms effected in the first six months of this year have helped improve the investment and trade environment and the province’s competitiveness, benefiting the public and businesses. There are 1,762 administrative procedures in use: 1,134 at level 2 (the user to download the required forms to be printed out and filled in), 497 at level 3 (forms can be filled online) and 29 at the highest level, level 4 (forms can be filled and payments can be made online). Following the improvements made this year nearly 92 per cent of administrative procedures can be completed through single-door and inter-agency one-stop-shop policies at the provincial level and more than 99 per cent at the district level. Eighteen agencies functioning under the People’s Committee, eight districts and Vĩnh Long city and 109 communes, wards, and towns have adopted a single-door policy. Five other agencies have adopted an inter-agency one-stop-shop policy. Besides, 239 administrative agencies in the province have achieved ISO 9001:2008 quality certification. Its Public Administrative Reform Index rating last year was 74.77 points, putting it in 44th place out of the country’s 63 provinces and cities. The province’s speed of administrative reforms has been slower than that of many other provinces and cities. The province’s Việt Nam Provincial Governance and Public Administration Performance Index (PAPI) score last year was 37.66 out of 60, putting it in 14th place. Improved responsiveness to public problems and a crackdown on corruption in the public sector and public services helped it improve its score.